When I first came across this water several months ago, I did not think much of it. It was sitting on the shelf with several other brands of mineral/spring water, and I picked it up for a moment or two. I thought that it was interesting enough, and the bottle certainly caught my eye, but I set it back down believing it to be just another bottled water product that cost a little bit more than I wanted to spend at the time. It wasn't until about a month later that I learned that the eye-catching bottle was actually clear. So impressed by the novelty of it all, I rushed out to the store to pick up a bottle, but was unfortunately unable to find one until just recently. BLK (capitalized for ease of recognition in the following paragraphs) is an all-natural spring water enriched with fulvic acid. As you can see in the image above, the water is indeed black. While this is definitely odd or unsettling at first, I can assure you that there is no reason to be alarmed. The color of the water comes directly from the fulvic acid, which is a naturally occurring mixture of mineral components. Fulvic acid is found in nature as a liquid colloid, thus resulting in the opaque color. If this has piqued your curiosity on the subject, visit the following Wikipedia pages for more information on colloids and the Tyndall effect that renders many of them opaque to the eye. It's very interesting stuff. Anyway, for those who are still not convinced that black water can be natural, just keep in mind that I bought this product at Earth Fare, an organic grocery store with very strict rules about what level of artificiality is allowed in the products that pass across company shelves. Additionally, according to the Wikipedia page for humic acid, attempts have been made to synthesize fulvic acid, but none have been successful. So, the long and short of it is that BLK basically has no choice but to use all natural ingredients. Fulvic acid has some health benefits as a dietary supplement, as well. The highly ionic nature of the compounds found in humic acids promote the absorption of other nutrients and minerals in the body, and are helpful in increasing the overall efficiency of other important dietary elements. As far as the taste goes, there really isn't much of any. Which is actually good in the case of a product that markets itself as water. As far as I could tell, BLK tastes just like regular water, although there was a hint of plastic in the taste, but no more than any other bottled spring water. There is a very, very faint granularity to the water (presumably from the added mineral complex), but it is not noticeable enough to be an actual concern. 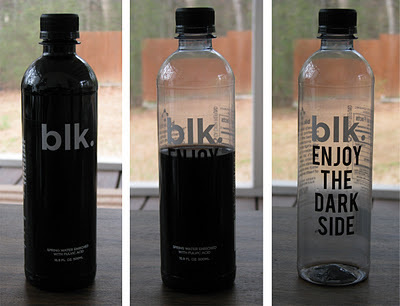 Basically, drinking BLK is just like drinking any other water. Now, I must admit that BLK is a bit of a novelty. If fulvic acid were clear, BLK would definitely not have much going for it other than the nutritional benefits of fulvic acid, and even those are a bit superfluous. From what I've found out about the science behind fulvic acid, the total nutritional benefits are somewhat slight, particularly when taken in small, irregular quantities. But frankly, it doesn't really matter. Sometimes it is okay for a beverage to rely largely on novelty appeal, and I feel like this is one of those times. The sheer peculiarity of drinking black water is enough to make me want to buy BLK, especially since it really isn't that much more expensive than any other bottled water. And the marketing campaign is absolutely fantastic. It was a lot of fun to slowly uncover the "enjoy the dark side" slogan as I drank through the beverage, and the bottle definitely does look good sitting on the shelf among its less exciting competitors. BLK may be a novelty, but I think that it is a fantastic novelty. If nothing else, it's a great conversation starter. Thanks for coming all the way over to my page to let me know when you posted this review. I actually came across here the other day looking for it. I feel safe enough to try BLK now that you've reviewed it but I can tell you right now that it's not something I see myself drinking regularly. did your tongue turn black after you drank it? Hiya, I'd just like to say a bit THANK YOU, for following me. Muchly appreciated. I'm gonna have a wee nosey at your blog, and follow you back. Hope you don't mind. Haha, Dawn, that is a great question. Fortunately, no it did not. And of course I don't mind, Bina. I hope that you enjoy the site. I was pleasantly surprised when I tried BLK. I am one of those people who is perpetually dehydrated with chapped lips, no matter how much water I drink. But this stuff seems to make the difference in my body actually absorbing liquids instead of just passing them. I put a shot glass of it into an 8 oz glass of water in the morning and I am good to go. Or I drink a whole bottle after a particularly taxing work out, like gardening or hiking +regular water. I love that it has no extra flavors, no sugars or preservatives. This is one of those rare times when something is just perfect for me.